One of the places I have fond memories of is Isaac Theatre Royal, where I have performed and been entertained throughout my childhood. It stands in the middle of our city, and is recognised by any Christchurch local as a fantastic venue for performing arts. 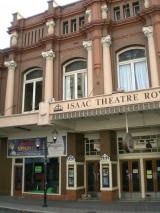 The earthquakes our city experienced ravaged older buildings, among them the Isaac Theatre Royal. This building sustained significant damage and the process of saving this beautiful building has been long and arduous. The facade was braced with shipping containers, and the rest of the theatre was demolished then rebuilt. This building is finally once again open to the public as it aims to raise funds for the rebuild and bring the building back to its former glory. The painted domes have been restored, and pieces within the theatre such as the marble staircase and the leadlight windows have been retained and restored. The building is now up to current earthquake codes, and there have been some improvements in accessibility and extra seating. For further information, you can watch the video below about the open day- well worth the insight into how this building has come to life again! One thing that will bring crowds back is The Phantom of the Opera- the first performance tanking place at the Isaac Theatre Royal. I was lucky enough to get amazing seats to this show on Thursday night, and marvel firsthand at the restoration job. It is amazing walking back into the theatre, and definitely brings back so many memories. The show itself was incredible, if a little loud at times as I was quite near to the speakers! The acts seamlessly blended into each other, and there were plenty of laughs from the audience. The fast-paced vibe of this show was not unwelcome, as the songs are such a memorable part of this musical and I was waiting to hear my favourites. One welcome surprise was seeing that my old vocal tutor from high school was in one of the principal roles as Monsieur Andre! I really could not fault the cast, and as well as the two lead roles the young Jane Leonard, playing Meg Giry, stood out for me as a strong performer. This season of the Phantom finishes tomorrow, and has received nothing but praise from those who have been to see it. Such a wonderful event to go to, and I thoroughly enjoyed it. If you are on the hunt for an other upcoming events, please be sure to stop by Eventbrite! If you are thinking of planning an event and selling tickets, Eventbrite can also help you by providing tools to make things run smoothly.